France is a country associated with gourmet food, iconic monuments and of course it has Paris, considered by some to be the most romantic city in the world. A place where starry-eyed lovers can stroll along the Seine river hand-in-hand or linger for hours in a French café surrounded by the “language of love”. With all that romance and love, you’d think Valentine’s day was a big deal in France, wouldn’t you? Well, it is and it isn’t. When is Valentines Day In France? Valentine’s day is celebrated on the 14th of February in France, just like it’s celebrated in the US, Canada, Japan and everywhere else that celebrates this day of love. The difference between Valentine’s day in France and the US? Despite the fact that many French people see Valentine’s day as an overly commercial celebration, nearly 1 out of every 2 French persons (47%), celebrate Valentine’s day anyway, according to a study conducted by ifop. However, the level at which the French celebrate Valentine’s day is nowhere near the level that Americans, Canadians and Japanese celebrate. Maybe even the British too? If you were to stroll around the streets of random cities in France, you might not even notice it’s valentines day. Flower shops and restaurants might make a thing out of the day and of course, some hotels will promote special Valentine’s day weekend deals to tourists but that’s pretty much it. Stores aren’t decked out with heart-shaped chocolate, candy hearts, teddy bears and other Valentine’s gifts. I think the main reason for this is because the French see this day as a day of spending time with the one that you love which might involve going to a diner. Spending a romantic weekend together and maybe, just maybe exchanging a small gift. And you can forget about valentines day cards. The French haven’t really caught on to the whole card giving, not even at Christmas. The exception is New years cards. Another difference between Valentine’s day in France and North America is that Valentine’s day is mainly celebrated by adults. between two people who are romantically involved. So your boyfriend, girlfriend, wife, husband, lover or someone who you are dating. You would never celebrate Valentine’s day with a friend. This means that young children in France never celebrate Valentine’s day like they do in North America. They don’t pass out valentines day cards or candy to all their classmates or prepare Valentine’s Day crafts for their parents at in school. It’s just not done in France. 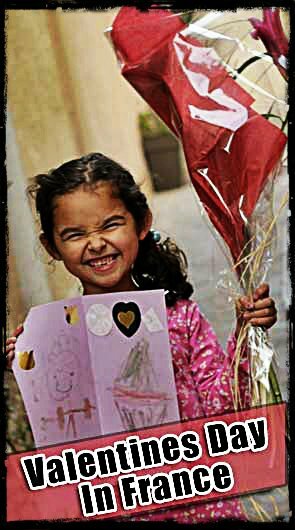 On a very rare occasion, a child might give another girl or boy a valentines gift is he or she is sweet on them but this is extremely rare. 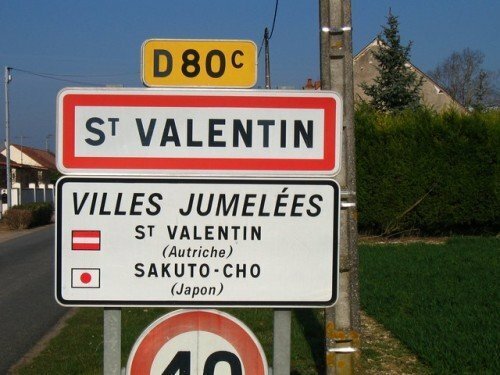 Despite the fact that Valentine’s day is generally pretty lowkey in France, the village of “SAINT-VALENTIN”, (named after the patron saint himself) has taken a totally different stance on Valentine’s day by embracing this otherwise commercial holiday with open arms. It’s basically capitalized on its namesake and turned itself into a Valentine’s day marketing machine and created a BOOMING tourist business around the day. This minuscule town of fewer than 300 inhabitants is located just 260 KM south of Paris and measures 11/km2 (29/sq mi). It first capitalized on its namesake back in 1965 when it celebrated it’s first Valentine’s day. The celebration wasn’t very big and it didn’t attract many people and that’s the way it continued for 15 years until one ambitious mayor decided to do something about the villages anonymity. 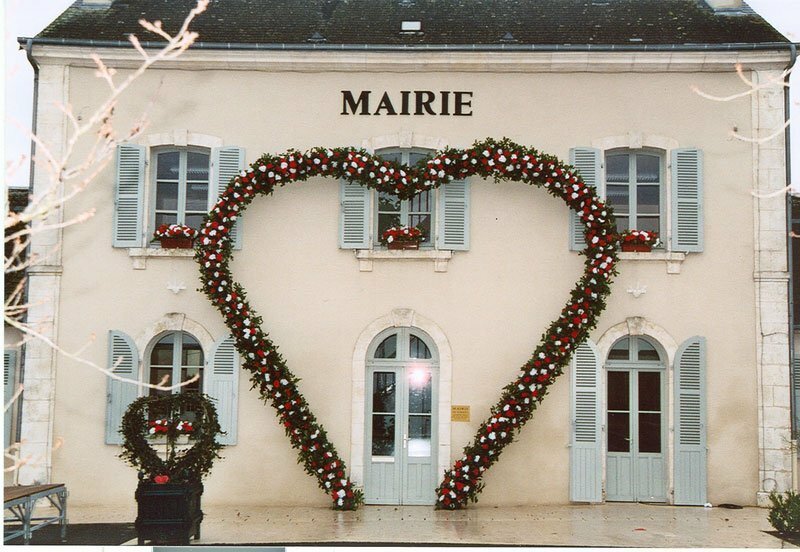 Back in 1980, the then-new mayor of Saint-Valentin village, Pierre Rousseau, wanted to boost the economy and attract more visitors to the small town, all year round, not just during Valentines week. 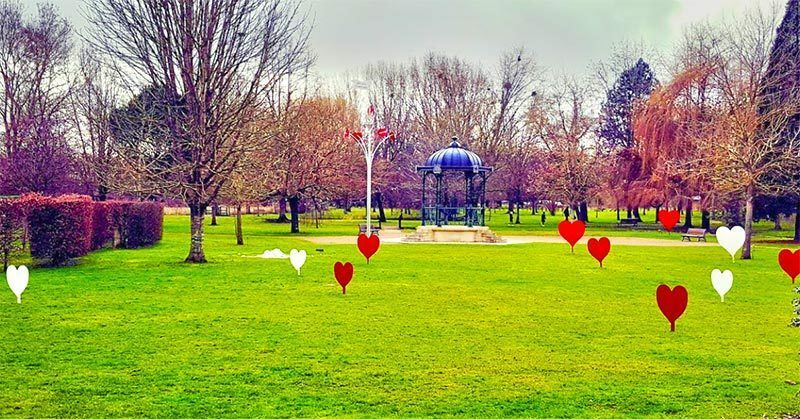 He came up with the idea to create a garden which would eventually be named Lovers Garden (Jardin des Amoureux), complete with an annual festival around St. Valentines day. 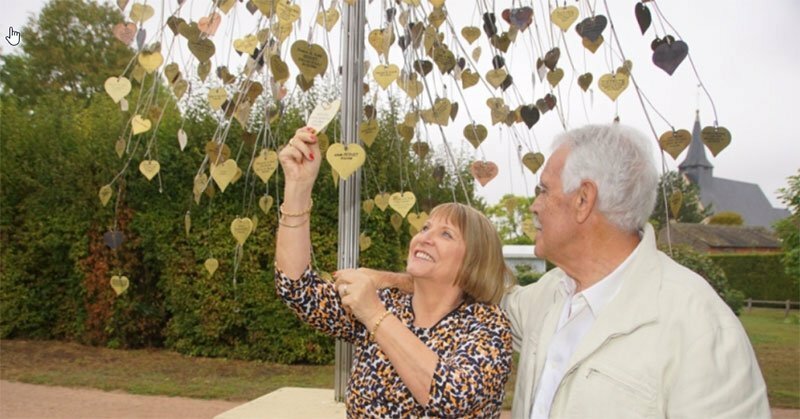 Slowly but surely, lovers from all over France started coming to lovers garden and partaking in the Saint Valentine’s day festival. Not millions of people but enough to keep the tiny town busy. 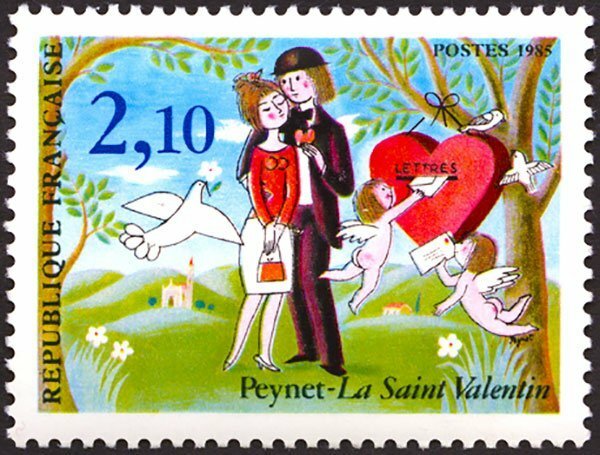 The post office even got in on the event by creating its own loved themed “cancellation postmark stamp” created by a famous French cartoonist, Raymond Peynet in 1980. 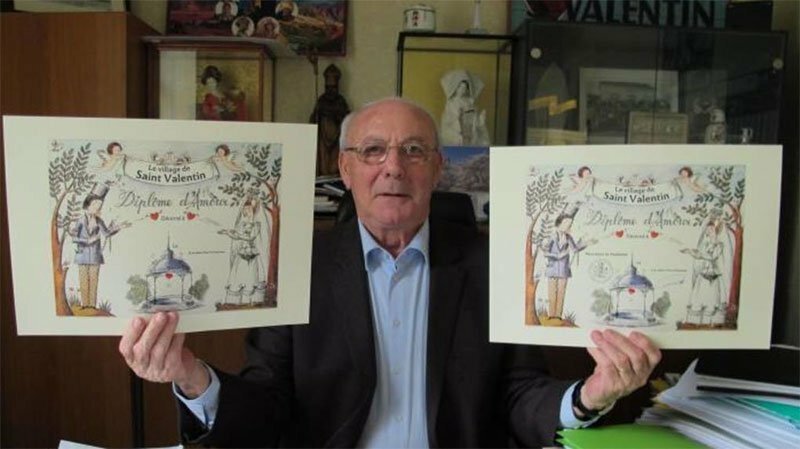 Then in 1985, a few years after the mayor created lovers garden, the post office of Saint-Valentin issued a special stamp, again using the artwork from French cartoonist Raymond Peynet, best known for his series “les Amoureux de Peynet”, lovers of Peynet. Today the Saint Valentine’s village festival attracts thousands of people from all over the world but especially from Japan. 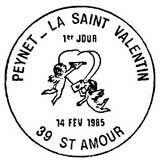 Supposedly, after the stamp was created, the tiny town of Saint-Valentin drew international attention of the Japanese who are crazy about Valentine’s day and absolutely love Raymond Peynet. 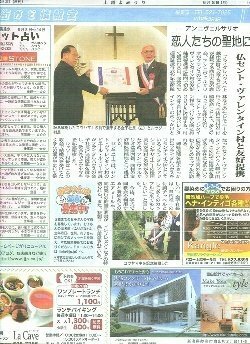 He might actually be more well known in Japan than in France which explains why there are two museums dedicated to the cartoonist in Karuizawa and Mimasaka Japan. With the towns new notoriety in Japan, the town became twinned (sister cities) in 1988 with a town called Sakuto-Cho (now called Mimasaka). 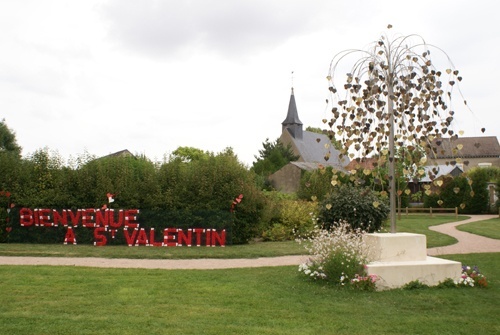 The village of Saint-Valentin also became sister cities with a town in Austria also called St Valentin. 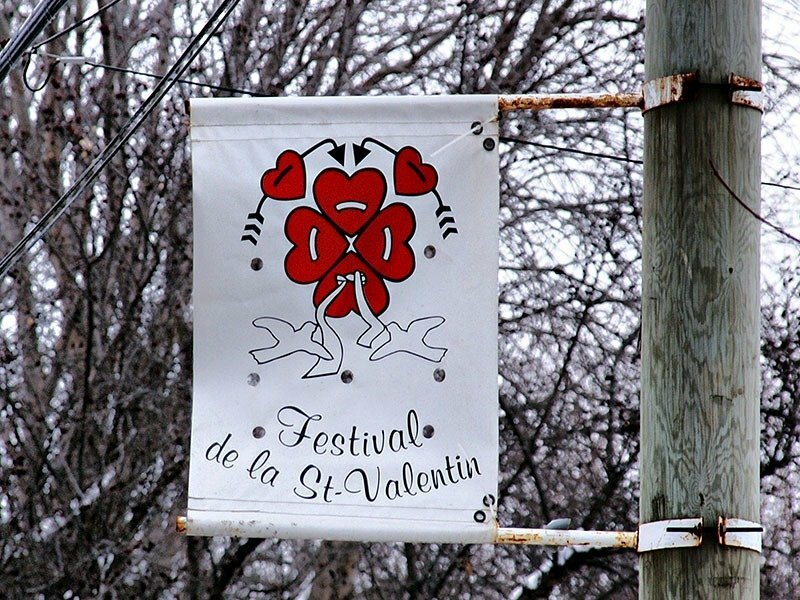 What’s the big attraction in Saint-Valentin? 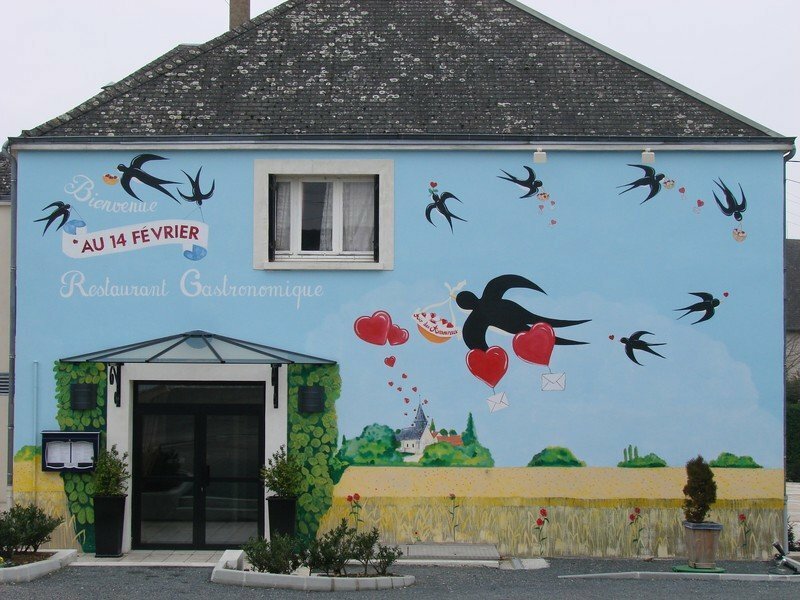 There’s plenty to do and see during the annual Valentine festival which usually lasts for three or four days from the 11th or 12th of February through the 14th and the whole town gets involved in turning the village into a love machine. The post office has a special stamp (mentioned above) for anyone who wants to mail a letter. Several weeks in advance, the citizens of Saint-Valentin decorate their homes with flowers and on the Sunday closest to the 14th of February, it’s also tradition for lovers of all ages to meet in the town, stroll through the streets to the sound of bagpipes, or walk the paths of the Garden of Lovers. Kind of like Alice in Wonderland meets valentine day feel. The festival is built around the main theme which is of course to attract lovers who want to get married, renew their vows or propose. 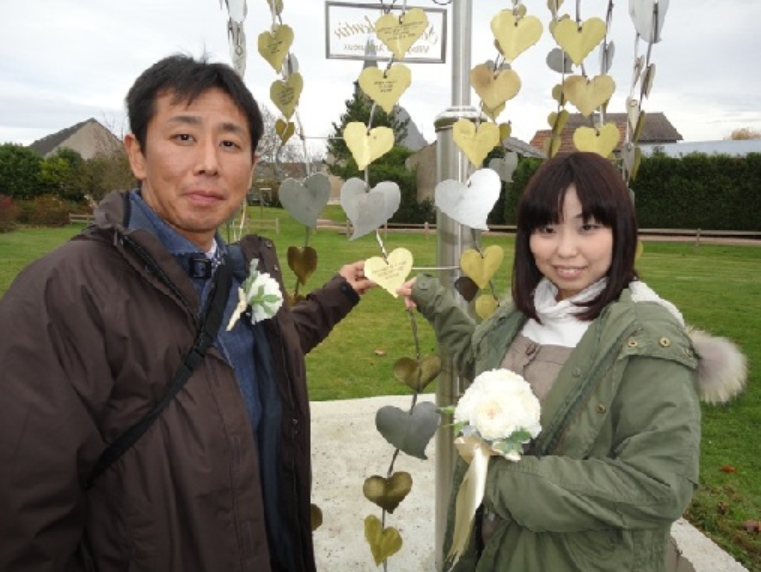 During the Saint Valentin festival, there are booths installed throughout the village where visitors can do a variety of things including watching a chocolate making a demonstration (Giving chocolate for Valentines day is a huge thing in Japan), to buying a wedding dresses, jewellery and other romantic items meant to get you in the mood. Here are a few other things that visitors to Saint-Valentin might like. 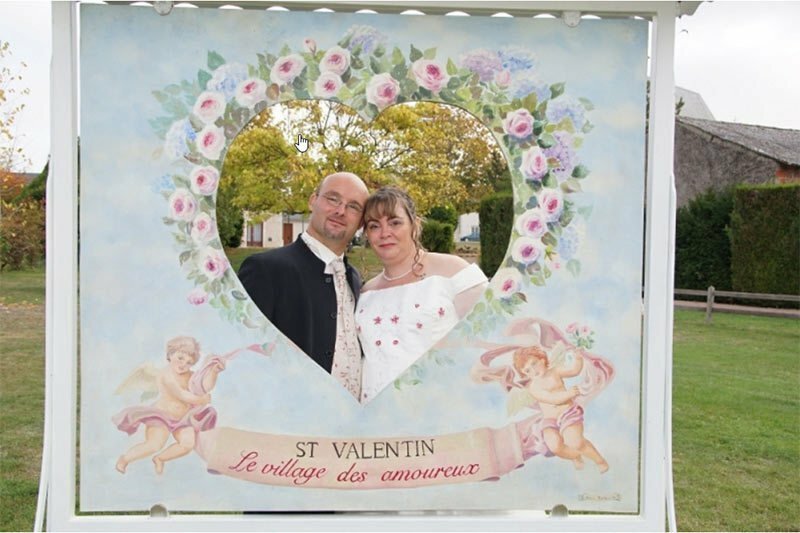 The mayor gives out “certificats aux amoureux,” lovers’ certificate at a ceremony followed by a romantic yet festive lunch and a ball in the evening. 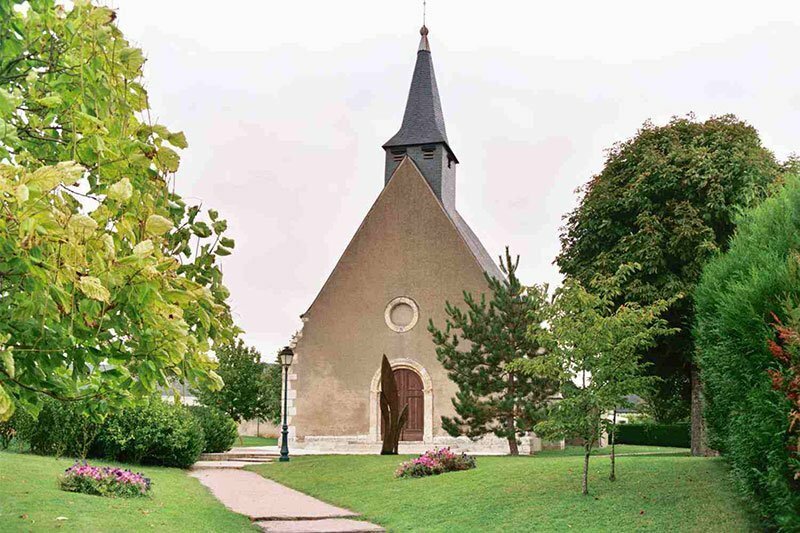 Attend a special Sunday Mass and blessing at the Saint-Valentin church. Get married or renew your vows in the garden gazebo. Get married or renew your vows in the town hall. Check out the review of the restaurant here. Can’t make it on Valentine’s Day? 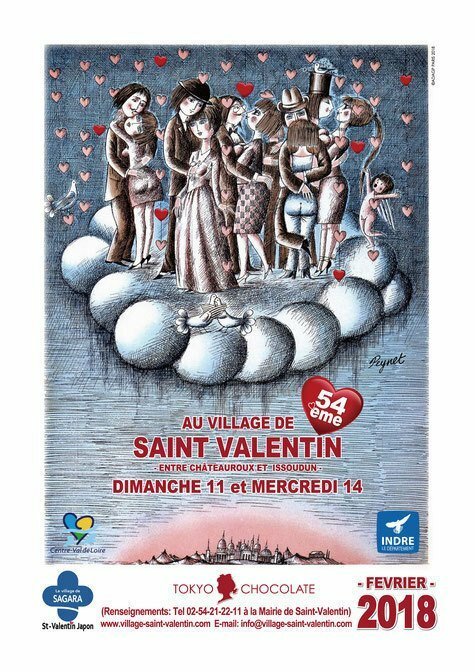 Don’t worry if you can’t make it to Saint-Valentin village for the Valentine festival. 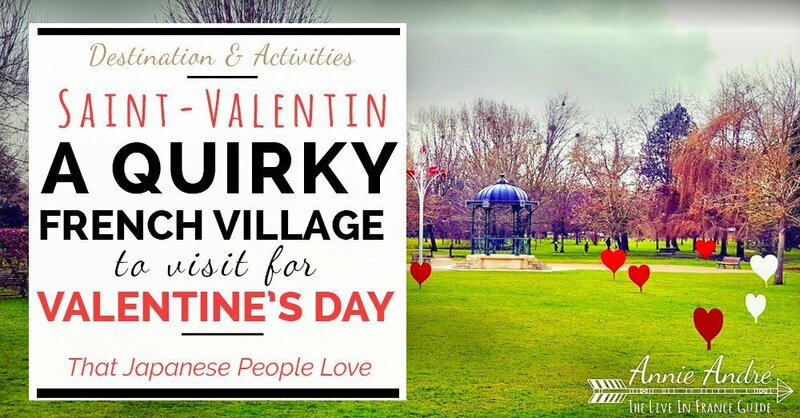 The village is open for the business of love all year round minus the festival of course. 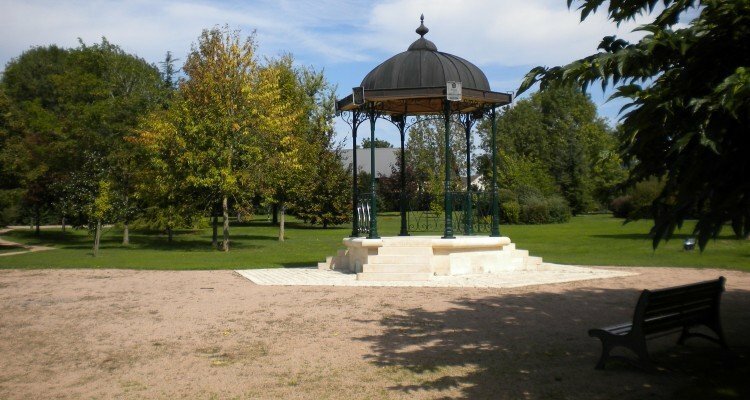 If you’re interested in visiting this quirky French town, you should know that there are not a lot of options for lodging in the town proper, however, there are some nice venues within 25 miles. If you’re interested in contacting the town hall to get married or renew your vows, you know you want to, here is their contact information. And finally, here are some Valentines day vocabulary words.